There are many waterfalls on the north and east side of the Big Island thanks to lots of rain and a large gradient in the altitude of the land. The size of these waterfalls combined with the lush and tropical rainforest as background makes them a popular and spectacular attraction to visit. 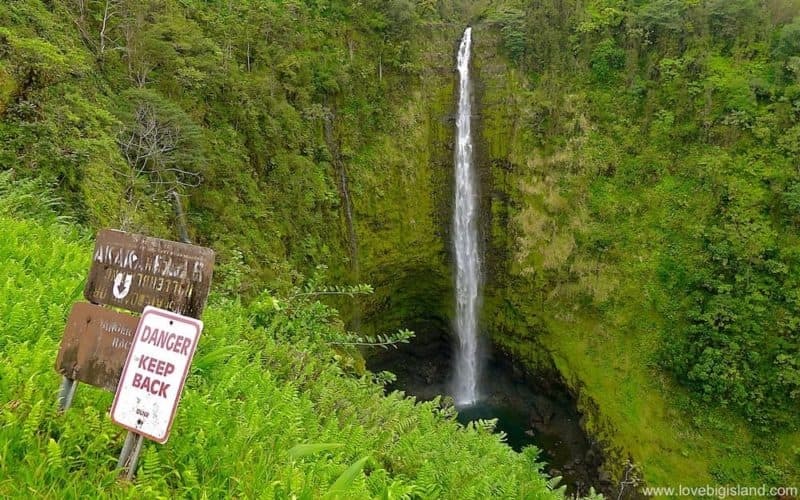 This means that you may have a luxury problem: that there are more waterfalls on the Big Island than you can reasonable visit during your stay! The light blue waterfalls marked on the map below represent our favorites that are described in more detail below. The dark blue/purple waterfalls are more difficult to see and smaller waterfalls. Most waterfalls can be found on the slopes of the Mauna Kea volcano close to Hilo and on the Hamakua coast. 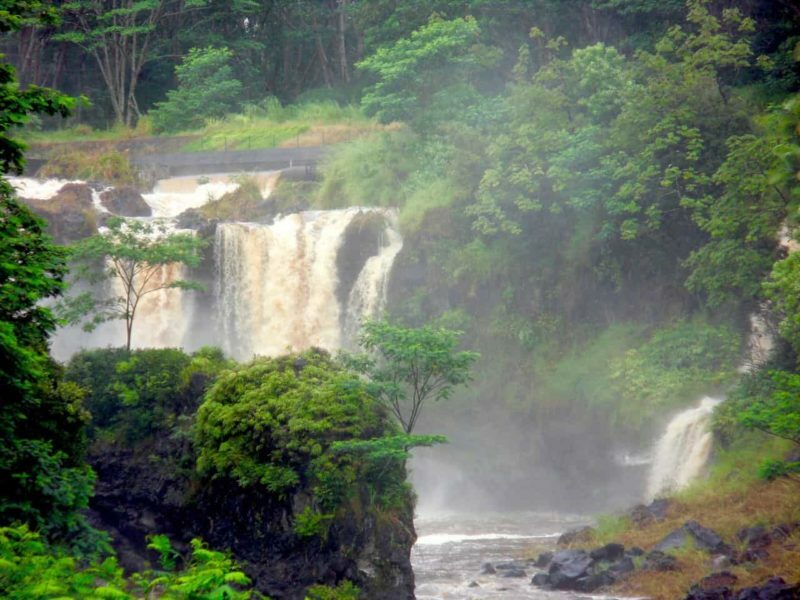 4 out of 5 of our favorites are close to Hilo, and these falls are very easy to visit. 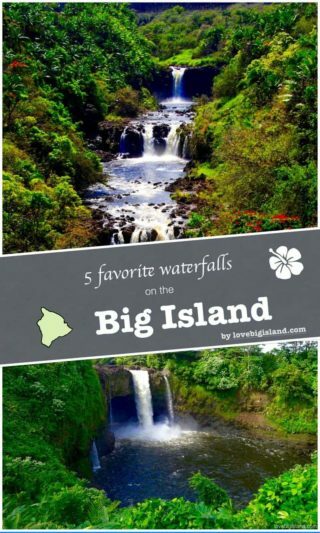 If you are on this side of the Big Island, for example, to see the Hawaii Volcanoes National Park, a bit of planning will make sure that you can see some spectacular waterfalls. More waterfalls can be found at the northern seaside cliffs and valleys of the Kohala coast. These falls are more difficult to visit and include the last of our favorites: the Hi’ilawe falls. The 422 ft tall ‘Akaka falls are part of the ‘Akaka falls state park, north of Hilo on the Big Island. The admission fee to the park is $5.00 per car or $1 per person for pedestrians. To get to the waterfalls you need to make a pleasant and short 0.4-mile hike through the lush rainforest filled with wild orchids, bamboo groves and draping ferns. The hike is suitable for the whole family and takes 1/2 hour if you take your time. The trailhead is easy to find – just off the parking lot. More information on visiting the ‘Akaka falls. 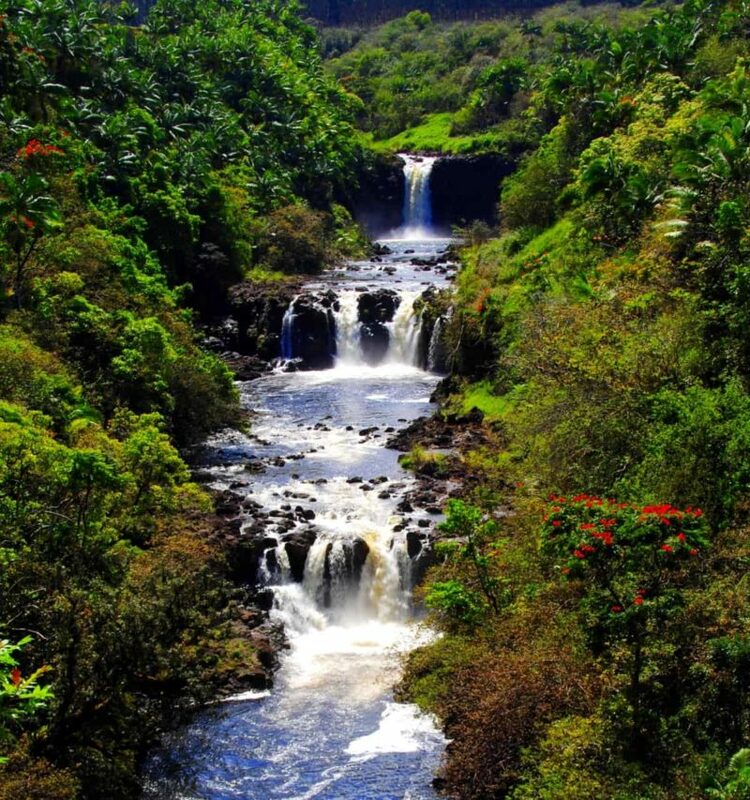 The Rainbow Falls in Hilo are the easiest waterfalls to visit on the Big Island. 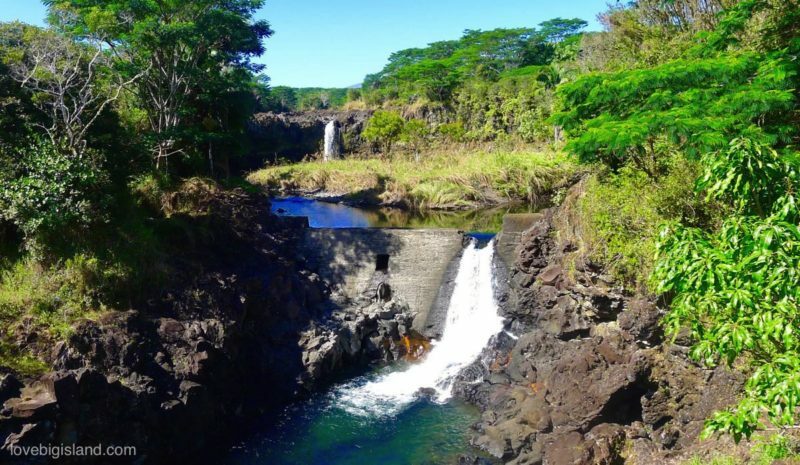 This broad waterfall in the Wailuku river is conveniently located within Hilo town. The best time to visit the rainbow falls is in the early morning because this is when you have the most chance to see rainbows in the spray of the waterfall. More information on visiting the Rainbow falls. The Pe’epe’e Falls are located about 1.5 miles upstream the rainbow falls, at the Wailuku river on the end of Wailuku drive. These falls are a bit smaller than the rainbow falls, and thus also far less crowded. If you are visiting the rainbow falls and have the time and interest to see another set of waterfalls you should check out these falls. If you are short on time, we recommend that you limit yourself to the more spectacular ‘Akaka and Rainbow waterfalls. These falls form also the access to a popular local swimming spot called the ‘boiling pots’. Swimming here can be dangerous and sometimes lethal. Please don’t take the risk – there are many places more suitable for swimming in Hilo (the beach!). Pe’epe’e Falls on the Big Island. Image credit: Mark. Shared under a CC BY-NC-SA 2.0 license. Just upstream from the Boiling Pots you can find another waterfall at the bridge over the Wailuku river in Hilo. The Umauma falls are three waterfalls in close proximity to the Umauma River, 16 miles north of Hilo on the Hamakua coast. Access to the overview for the waterfalls lies on private land which is being managed by the Umauma Experience. 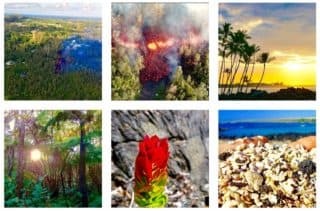 Access costs $12 per person (2019), which also buys you access to their garden [more information on the Umauma experience website]. You can also see these waterfalls as part of a zipline tour. Umauma Falls on the Big Island. Image credit: Anirudh Rao. Shared under a CC BY-NC-SA 2.0 license. 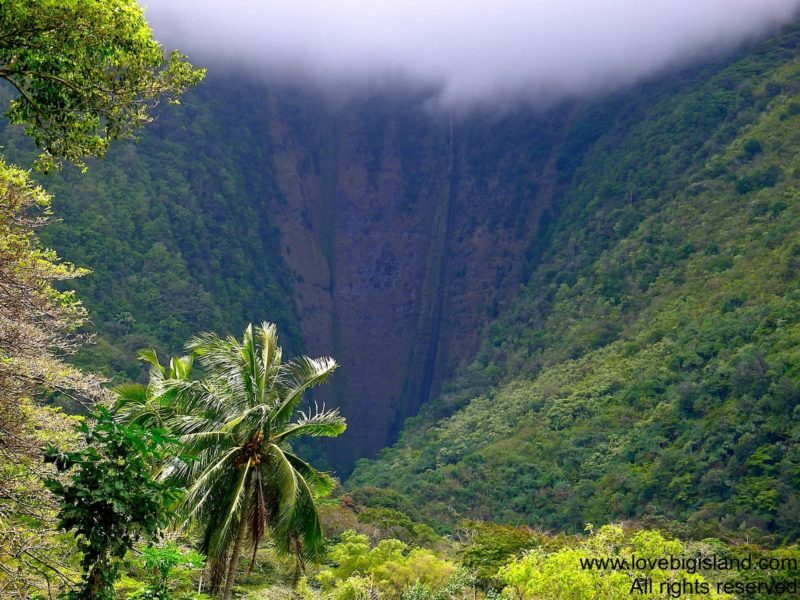 The Hi’ilawe waterfall is one of the tallest waterfalls of Hawaii. The total height of the falls is about 1,450 feet (442m), with a highest direct drop of 1,201 feet (366m)! You can see the Hi’ilawe falls from inside Waipi’o valley. You can drive down yourself (only with 4×4, see link above), or get down to the valley floor as part of a horseback riding tour of Waipi’o Valley. Note that the river feeding the waterfalls is used for irrigation purposes. This can cause the falls to be (almost) dry even during the wet season. Hi’ilawe (the barely visible waterfall in the back of the valley) is one of the tallest waterfalls of the Big Island. This picture shows the Hi’ilawe falls on an almost dry day. 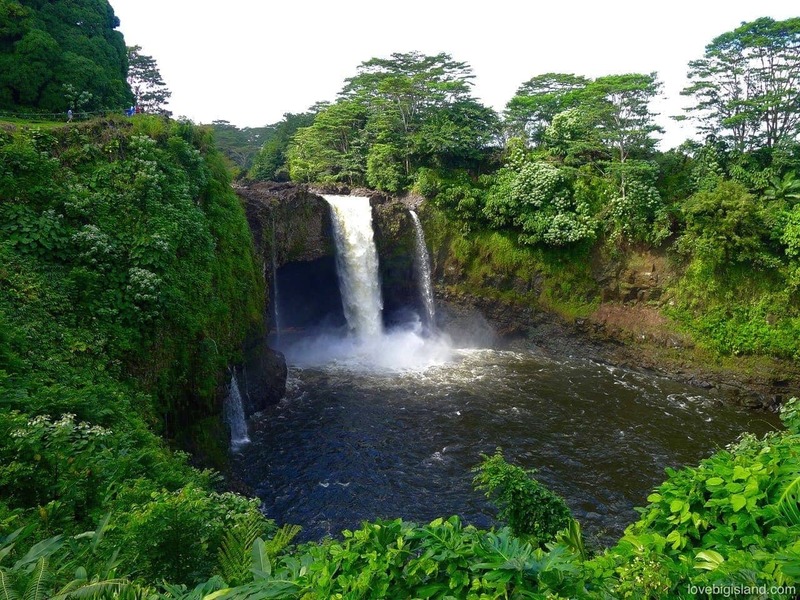 In Hilo: Rainbow falls, Pe’epe’e falls, Wai’ale falls, Kulaniapia falls. On the Hamakua coast: ‘Akaka falls, Kolekole falls, Umauma falls, Onomea falls, Nanue falls, Hanapueo falls + lower Umauma falls. On the Kohala coast: Hi’ilawe falls, Waiulili falls. The location of these waterfalls is marked on the map higher up this page. You can read more about each fall separately in the list of 13 Big Island Waterfalls. There are several ways people choose to see the waterfalls. Of course, the most popular and simple strategy is to include a visit into your itinerary as you drive by one or two waterfalls. This adds ~1 hour/waterfall to your itinerary will be the best option for the large majority of visitors. Alternatively, you could think of making a scenic drive to see all the waterfalls close to Hilo in half a day. This would allow you to see 4 of our 5 favorite waterfalls and is recommended for people that really love tropical waterfalls. Finally, you can spend a bit more money and see the waterfalls on a guided tour (such as this one) or, together with the volcano, as part of a helicopter tour. This last option is more expensive than typical activities here on the Big Island but it is very impressive!